ASUS reveals the Eee PC X101, claiming it's world's thinnest and lightest netbook. 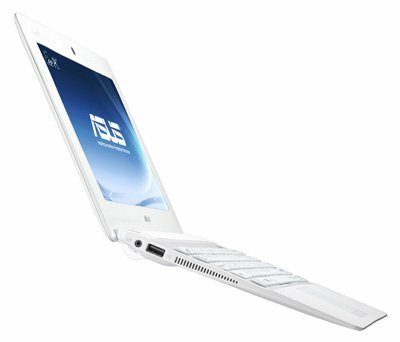 ASUS has launched the Eee PC X101 netbook, the world’s thinnest and lightest netbook. Announced earlier this year at Computex, the X101 has a super thin 17.6mm profile and weighs a mere 920g so it is easily slipped in to bags for superior portability. Preloaded with the new MeeGo operating system, the X101 allows users to stay connected to their favorite social media sites like Facebook, Twitter and more. This is the perfect netbook as a first computer for kids, teens, as well as students. The X101 shatters the mold of past netbooks with its super thin profile of 17.6mm and a lightweight 920g, yet is still equipped with all the standard netbook goods. It features the latest Intel® Atom™ N435 processor with 1GB of RAM, 2x USB 2.0 ports, a MicroSD Card reader, built-in webcam and 8GB SSD for quick startup and launch times. ASUS Super Hybrid Engine (SHE) technology is also built-in to help conserve battery life for the X101, which is available in a variety of colors including white, black, brown and red. While the X101 is a great computer to stay connected, it is also a great tool to learn the world’s international language, English. Offered on the X101 is the British English Language Learning application, which comes in the form of a content bundle of interactive games, videos and mp3s which are pre-installed on the X101. Over 300 pieces of material was developed by English Language Training (ELT) leaders and the British Council, with the application designed by Intel’s award winning Performance Learning Solutions. The Eee PC X101 netbook is also offered in the X101H configuration, which comes with the choice of either Windows® 7 Starter with a 250GB HDD, or MeeGo OS with 8GB SSD. The X101H model gives users the option to choose the environment they are more comfortable with.